A Rudy Tomjanovich personal appearance, Rudy Tomjanovich speaking engagement, or Rudy Tomjanovich endorsement will reflect well on your company. To hire Rudy Tomjanovich now for any corporate appearance, fundraiser, motivational speaker event, personal appearance, autograph signing, or website endorsement please contact our celebrity agents at 1-877-6-SPORTS. We will contact Rudy Tomjanovich or contact Rudy Tomjanovich's agent and provide you with the booking fees and availability immediately upon your request. Direct Sportslink is the only sports speakers bureau and talent booking agency based in the United States securing only sports talent for corporations, associations, and organizations for motivational speaking engagements, personal appearances, and endorsements. We are the premier sports celebrity booking agency and a sports celebrity procurement expert. Accordingly, we will provide you with any relevant Rudy Tomjanovich website information and booking agent details so that you can hire Rudy Tomjanovich for your next event. Tomjanovich was selected in the 1970 NBA Draft as the second pick by the San Diego Rockets (after 1971 the franchise relocated to Houston), for whom he would play the entirety of his NBA playing career. In his eleven years in the NBA, Tomjanovich had a scoring average of 17.4 points and a rebounding average of 8.1. The Rockets retired Tomjanovich's #45 jersey upon the conclusion of his playing career. (His collegiate jersey, also #45, was retired by the University of Michigan in 2003). He would later become the Rockets' head coach, leading them to back-to-back NBA championships in 1994 and 1995. 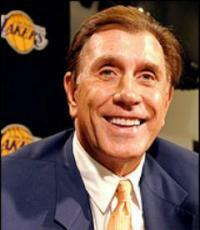 In 2004, Tomjanovich took over as the coach of the Los Angeles Lakers. After just 41 games, he resigned due to health issues. Tomjanovich stayed with the Lakers as a consultant. In 2000, he led the U.S. Men's Senior Team as head coach to the gold medal at the Olympics. On February 15, 2006, Tomjanovich was named the director of scouting for USA Men's Basketball. Based on your interest in Rudy Tomjanovich as a speaker or for a personal appearance, Direct Sportslink has provided you additional links below for other sports talent with similar appearance fees, speaker topics, and categories that match Rudy Tomjanovich.